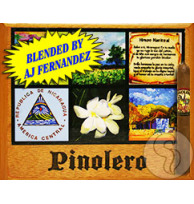 Pinolero is AJ Fernandez's follow-up to the wildly popular San Lotano and San Lotano Oval. This one sticks to the stronger side, checking it at medium-full bodied and utilizing a healthy dose of the Fernandez Family Ligero to comprise its filler blend. The Sun Grown wrapper and Corojo binder give this one a spicy kick, one aficionados can really sink their teeth into.